Beginning with the Flood of Atlantis, Archiati places the religions in the context of human evolution, taking us through the development of Buddhism, Zarathustrianism, Judaism, Christianity, Islam, and onwards to the future of religion based on spiritual knowledge. This is not a theoretical study, however, but one based on spiritual reality. For example, Archiati considers how the founders of the various religions are working today. Are the Buddha, Krishna, Moses and Zarathustra doing and telling us the same things now as they were in the past, even though humanity has undergone considerable changes since? PIETRO ARCHIATI was born in 1944 in Brescia, Italy. He studied philosophy and theology, and worked for many years as a Catholic priest. 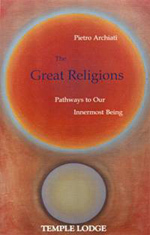 In 1977 he had a decisive encounter with the work of Rudolf Steiner. He later worked as a teacher in a seminary in South Africa. Since 1987 he has been working independently as a freelance lecturer and author for a regeneration of humanity through a modern scientific awareness of spiritual beings and realities.